-- Image credit: Blackbird Film Co.
Last month I woke to headlines in the mainstream media claiming that, based on a study conducted by the University of Texas and others, between 100,000 to 240,000 women aged 18 to 49 in the state of Texas have tried to self-induce abortion since strict abortion laws were recently enacted by the state. The first reaction of the many Americans reading these stories likely involved shocking mental images of women pursuing dangerous, sometimes-fatal options involving coat hangers and knitting needles. As someone who has worked in women's health for over 25 years, I heard first-hand the stories of women in the US who were faced with an unplanned pregnancy before abortion was made legal. Media stories of self-induced abortion and its associated horrors during that time brought those tragic stories to light, and shortly thereafter, Roe vs. Wade was passed. As one reads more about the recent experience of Texas women taking abortion into their own hands, a very different image becomes clear. The self-induced abortions of Texas women in 2015 do not mirror those highly publicized abortions of the late 1960's and early 1970's. The most common method of abortion reported in the recent study was the use of herbs or homeopathic medications, or more commonly, use of the drug Misoprostol; also known by the brand name Cytotec. Medication abortion as provided by a licensed medical professional in the United States typically consists of the use of two medications, Mifepristone and Misoprostol. These medications have been used for over 15 years in the US and are incredibly effective and safe when used under medical supervision. Women report being very satisfied with the experience of using them to end an early pregnancy. Misoprostol alone, while not quite as effective, can also be used to successfully induce an abortion. Because Misoprostol is more easily obtained in Mexico, it can be deduced that American women in Texas are finding ways to gain access to this drug from across the border. This discussion is important right now as the Supreme Court has agreed to hear a case (Whole Woman's Health v. Cole, No. 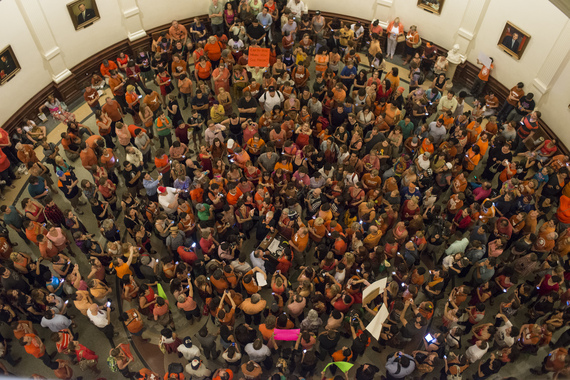 15-274) that challenges a Texas law requiring abortion to be exclusively delivered in ambulatory surgical centers. The renovations required by these laws to clinics in Texas have proved to be so costly that there are now just 17 health centers left providing access to abortion care in Texas, compared to 41 in 2012. If the Supreme Court upholds this law, the number of clinics providing abortion care in Texas is expected to drop to just 10. This, in a state that is 10% larger than the country of France. Since the remaining 17 clinics are located in Texas' largest cities, a big percentage of women in rural, economically challenged areas have been forced to fend for themselves. But let's get real, these women are not self-inducing using the same methods used 40-50 years ago, as some misleading media headlines have suggested. They are using the methods mentioned above, which are inherently safer, but doing so alone, and without supervision. And that's where the uncertainty lies in taking a medication without medical approval and assistance. What if something goes wrong? What if the medication obtained is not quality controlled. What if they take too much, or not enough? The safest method for a medically induced abortion is with the support and guidance of trained medical staff, which of course, the state of Texas is ridding itself of. I'm not here to rail against Texas and its politics, though I do think requiring the construction of a hospital building to provide a tablet is a bit unnecessary, and as the women of Texas have shown, will not be tolerated one way or another. Rather, I'm here to change the dialogue about abortion, and in doing so, challenge the public's perception of abortion and the reality of what women will do to maintain control of when and whether to have children. While I am grateful we have moved beyond the realities of illegal abortion before 1973, women still deserve better. And we are not willing to move backwards.